In September 2008, JDC-ICCD launched a major research project examining contemporary Jewish identity in Eastern Europe. Entitled Identity à la Carte, it was focused on 18-60 year-old Jews, and investigated how they understand and experience their Jewish lives, how they feel about core Jewish issues and how they relate to the realities of the new Europe. The project has been implemented in nine significant Eastern European Jewish communities: Budapest (Hungary), Warsaw (Poland), Wroclaw (Poland), Krakow (Poland), Riga (Latvia), Bucharest (Romania), Oradea (Romania), Timisoara (Romania) and Sofia (Bulgaria). 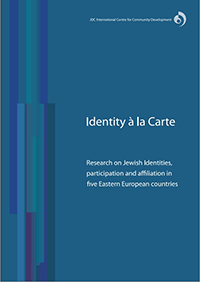 Providing high-quality, up-to-date and comparable data, Identity á la Carte represents the largest and most ambitious survey ever conducted on East European Jewry, and generates new and important insights for leaders seeking to better understand this demographic, and enhance Jewish life across the continent. Involved in this project were Professors Sergio DellaPergola, (Hebrew University, the leading Jewish demographer in the world today), Barry Kosmin (Trinity College and former Executive Director of the Institute for Jewish Policy Research in London, UK) and Erik Cohen (Bar Ilan University, and a specialist in French Jewry), as well as two community-based demographers: David Graham (Board of Deputies, UK, former JPR Fellow in European Jewish Demography) and Chris Kooyman (Joods Maatschappelijk Werk, Netherlands, and expert in Dutch Jewry). The academic specialist who led the Eastern European segment of the project is Professor András Kovács of the Central European University (Budapest). Ipsos, a well-known research consultancy with an international reputation and extensive European operation, managed interviews and data collection.